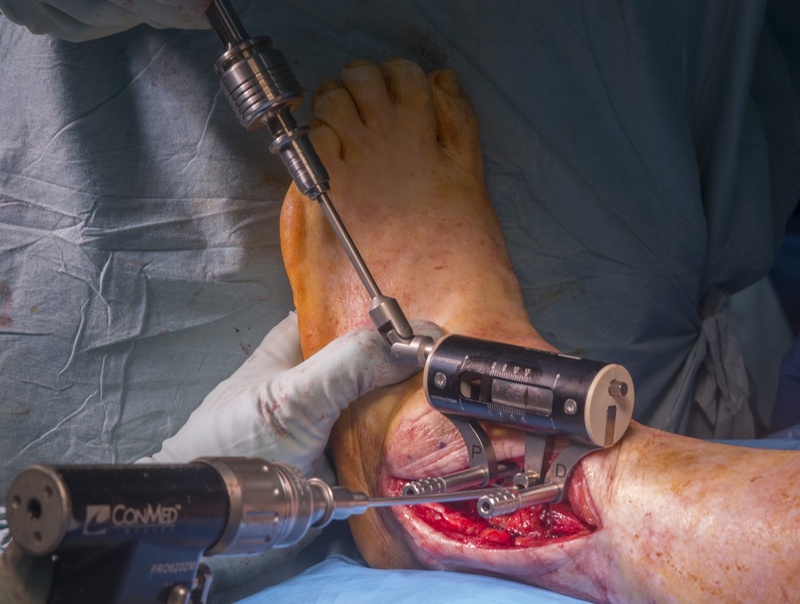 Learn the Open ankle arthrodesis using Ankle Fix 4.0 plate (Zimmer-Biomet) surgical technique with step by step instructions on OrthOracle. Our e-learning platform contains high resolution images and a certified CME of the Open ankle arthrodesis using Ankle Fix 4.0 plate (Zimmer-Biomet) surgical procedure. Ankle arthrodesis is an established treatment for painful, end-stage ankle arthritis. Over the last century, a number of operative techniques have been popularised, with modifications reflecting technological advances. These have ranged in methods of fixation from the Charnley external clamps through to all manner of crossed/parallel screw fixation techniques. However, managing deformity, poor bone quality or bone loss remain difficult issues to resolve using traditional techniques. As a result, biomechanical studies into the properties of angle-stable devices such as blade plates and non-anatomic locking plates have found some mechanical advantages over screws in stabilising an ankle arthrodesis, thus potentially offering a solution. Therefore, in Sheffield, Mr Mark Davies and Mr Chris Blundell developed a new anatomically contoured, fixed angled lateral locking ankle arthrodesis plate – the Ankle Fix 4.0. Manufactured by ZimmerBiomet, we have successfully used this device for open ankle fusion surgery especially in more challenging clinical situations. The rationale behind the plate design was formed after both authors had gained experience using an inverted PHILOS plate. It was felt that a set of divergent screws within a low-profile talar section would offer a significant pull-out strength in cancellous bone and similarly that convergent screws in the tubular, cortical bone would provide robust tibial fixation. These screws were specifically designed to be 4.0 mm in size to allow clustering of the screws which contrasts with the larger, less versatile plate designs that were on the market at the time of design in 2009. With limited literature on the wealth of new locking ankle fusion plates, the plate designers present these results and discuss their large series in the December 2017 issue of the journal Techniques in Foot and Ankle Surgery. Institution: The Northern General Hospital ,Sheffield ,UK.